← Are Urban Sustainability and Resilience legitimizing social un-justice? Guest authors: Enzo Falco (GSSI Cities, Gran Sasso Science Institute) and Alessandro Rinaldi (PhD in Territorial and Urban Planning, Sapienza, University of Rome). Abstract: The academic future of PhD students in Italy looks uncertain. Job opportunities are few and tenured faculty staff is constantly decreasing in number. This post based on actual and time series data highlights the difficulties that current and new doctors are facing in Italian academia. This post wants to start by posing a simple and current question that we hope is of interest to current PhD students in Italy and perhaps around the world. Do doctoral students have the opportunity to stay in academia after completing their PhD studies? If not, do we need to change doctoral education in planning and urban studies to explicitly train researchers not only for academia? This post reports on the findings of a short research paper that was published in the Italian Journal of Planning Practice in late 2015 and, as far as Italy is concerned, things do not look good for students in all sectors. Data show a steady decrease in tenure track faculty staff and new advertised positions are few. The Ministry for Education, University and Research (MIUR) database allows us to gather relevant data and show the current reduced opportunities for new doctors to pursue an academic career in Italy. Data were collected for the period 1997 to 2014 with regard to all tenured faculty staff and number of annual PhD titles awarded in all disciplines for Italy as a whole. Figure 1 below shows the increasing number of faculty staff until 2008 which is followed (see the effects of the international financial crisis) by a marked and steady decrease, still happening, in total faculty positions at 1999-2000 levels. At the same time, while tenured faculty positions constantly decrease, the number of annual PhDs awarded has reached about 10,000, skyrocketing after 2002. The combination of these 2 inverse trends shows a worrying reality for current PhD students in Italy. There is no or little opportunity for them to stay in academia. If the number of newly awarded doctors since 1998 has reached over 120,000 in total, the number of faculty positions has not increased at all. 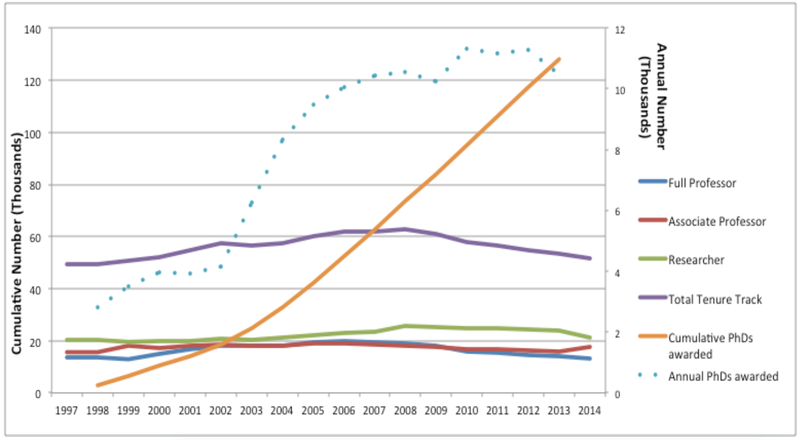 Figure 1 – A trend comparison between total tenure track positions and annual PhD titles. Source: Authors’ elaboration on data from MIUR database (2015a). Taking a closer look at the Civil Engineering and Architecture disciplinary sector (ICAR) (planning is part of this sector), things do not change. Figure 2 shows that tenured positions keep decreasing since 2008 while the number of new doctors who graduate annually are in the range of 700 to 800. PhD titles awarded in ICAR. Source: Authors’ Elaboration on data from MIUR database (2015a). Further data on job openings (MIUR, 2015b) highlight that in the period March 2013 to December 2015 only 13 new researcher positions (lowest level of university career) were opened in the disciplinary sector of Urban Planning and 207 for the sector of Civil Engineering and Architecture as a whole, usually referred to as Research Area 8 (Table 1). This, if compared to the about 2,000 new doctors for the Civil Engineering and Architecture sector who graduated between 2013 and 2015 (Fig. 2), shows a low opportunity (about 10%) for PhD students to stay in academia, in line also with international research, specifically in the fields of science and engineering in the U.S. (Fig. 3 shows a valuable comparison although showing slightly different data from those displayed in Fig. 1). Source: Data from MIUR database of job openings (2015b). Figure 3 – New faculty positions versus new PhDs. Source: Schillebeeckx, Maricque, and Lewis (2013). Given these trends, it seemed necessary, opportune and for sure fair that current PhD students in planning and urban studies got to express their impressions, expectations, needs and worries. The special issues of IJPP aimed to collect them with regard to specific research questions and interests relative to the Italian context. As seen in Fig. 3 the situation is shared with the U.S., at least as limited to the field of science and engineering, and it would be of extreme interest to find out about trends and academic opportunities in other European countries. IJPP is open to give space to the debate and accept contributions on the topic from around the world. MIUR (2015a) Ufficio di Statistica MIUR. Available at: http://statistica.miur.it/scripts/personalediruolo/vdocenti0.asp and http://statistica.miur.it/scripts/postlaurea/vdottori1.asp. MIUR (2015b) Bandi per ricercatori a tempo determinato. http://bandi.miur.it/jobs.php/public/cercaJobs?jv_comp_status_id=*&bb_type_code=%25&idsettore=08%2FF1&idqualifica=22&azione=cerca&x=159&y=28. SCHILLEBEECKX, M., MARICQUE, B., & LEWIS, C. (2013). The missing piece to changing the university culture. Nature biotechnology, 31(10), pp. 938-941. Enzo Falco is post-doctoral research fellow at the GSSI Cities, Gran Sasso Science Institute He conducts research on betterment value recapture in Italy and participatory planning and community informatics. He is co-editor for the online Open Access Italian Journal of Planning Practice. Alessandro Rinaldi is a PhD Candidate in Territorial and Urban Planning at Sapienza, University of Rome. He conducts research on the strategic environmental assessment and its relationship with decision making in planning processes. He is editorial assistant for the online Open Access Italian Journal of Planning Practice. This entry was posted in Academia, research quality and assessment and tagged academia, future, IJPP, Italian Journal of Planning Practice, Italian university, PhD, research jobs, university, university jobs. Bookmark the permalink. 3 Responses to The future of PhD students in Italian academia. What does it look like?